Happy Black Fives Day! 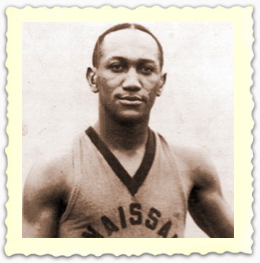 On February 10, 2013, Mayor Bloomberg issued a proclamation celebrating the legendary black basketball teams that paved the way for today’s stars, even as they faced terrible segregation in their own time. Though black fives (so named for the number of players on the teams) abounded throughout the country, no team was better than the New York Renaissance, also known as the Harlem Rens. The lively setting demanded a more fun, flashy style of basketball than the predominant plodding, hold-the-ball strategy. Rens star John Isaacs is credited for popularizing the pick and roll, and none other than UCLA’s legendary coach John Wooden called the Rens the best passing team he’d ever seen. Team Captain “Fats” Jenkins. Photo courtesy of BlackFives.org. Though Rens were the toast of the town in Harlem, they spent much of their year on the road, playing and winning in front of hostile crowds every single night. In 1933 they won an incredible 88 straight games in three months, and the Rens 27-year record was a whopping 2,318-381. Another context for their greatness is how they played against elite all-white teams. They won more than half of their battles against the Original Celtics, whose mastery of team defense was a great foil to the Rens’ up-tempo style. (In 1925, the Celtics refused to join the American Basketball League unless the Rens were also admitted, though they relented the following year under economic pressure.) In 1939, the Rens took down the best all-white team, the Oshkosh All-Stars, to claim the unofficial world championship. During the 1940s, however, the Rens were supplanted by another all-black team, the Harlem Globetrotters, who were actually from Chicago, and the star Rens were retired before they could shine in the integrated National Basketball Association. 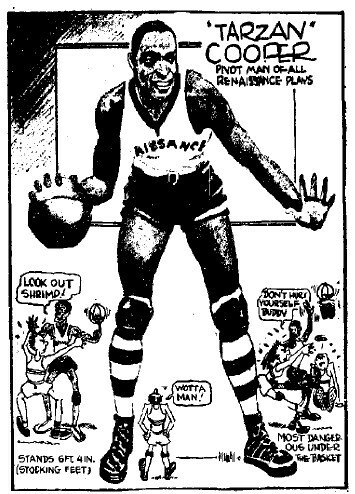 Cartoon of Hall of Famer Tarzan Cooper, one of the great centers of his day. In 1963, the epic 1933 team was enshrined in the Basketball Hall of Fame, and they were later joined there by manager Bob Douglas (the first African-American in the Hall of Fame), Pop Gates and Tarzan Cooper, who were inducted in their individual capacities. No article on the Harlem Rens would be complete without a shout-out to Claude Johnson, a Harlemite who continues to work tirelessly to salvage the nearly forgotten history of black fives basketball. His site, blackfives.org, is the main place to learn not just about the Rens, but the many important players and teams from the pre-NBA era. The Black Fives Day proclamation specifically thanks Johnson for his work on preserving and reviving this important part of basketball and New York City history.